Catch up on the action from Thursday and Friday! Ultiworld’s reporting on the Women’s division of the 2017 National Championships is presented by VC Ultimate as part of their year-long support of our women’s coverage. All opinions are those of the authors. Please support the brands that make Ultiworld possible and shop at VC Ultimate! Trying to catch up quickly on what’s happened at Club Nationals as we enter Semifinals Saturday? Here’s a quick recap of the action. Tournament no. 1 seed Seattle Riot was shocked by a powerful Atlanta Ozone in quarterfinals, allowing a margin they could not recover before the hard cap blew. Ozone finished the game 12-11 to advance. The defending WUCC Champions will not only miss the semis, but they will fail to qualify for Worlds in 2018. 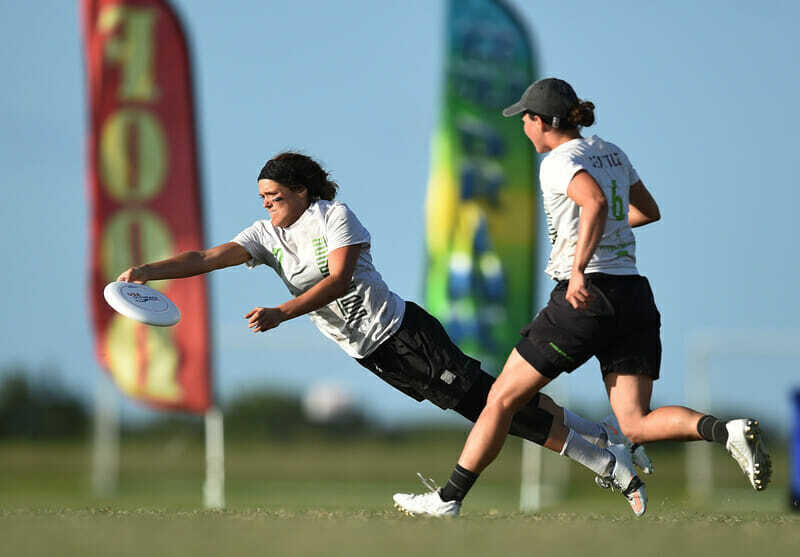 Propelled by an effective deep strategy and powerful throwers, Atlanta Ozone built a big lead on Seattle Riot and held on late to win in the hard cap. Keep your eye on Mira Walker, Emily Lloyd, and Kate Travaglini tomorrow in the semifinal for Ozone. Their excellent timing and sticky hands are crucial to Ozone’s game. Paula Seville, in her first year with Ozone, leads the division with 17 assists. Brute Squad and Fury continued to exercise utter dominance. Both teams have only allowed 23 points in four games each. Of the teams that qualified for semifinals, Boston Brute Squad leads all contenders in blocks recorded with 49, and no team scored more than eight points against Fury. Molly Brown’s depth has showed through the weekend, and they advanced to the semifinal due to big time blocks from Jesse Shofner and Manuela Cardenas coupled with impressive offense from Claire Chastain, Sarah Pesch, and Liza Minor. Cardenas has made the difference Molly Brown was hoping she would. She leads Denver in blocks so far, and she’s patient and skilled on the turn. Lisi Lohre, Liza Minor, and Nhi Nguyen are tied with eight goals each. The wind showed in most teams’ resets during pool play and the early bracket. Many games between lower-seeded teams would be defined by the direction of the wind – which was predominantly upwind/downwind – and deeper teams with better throws gained an advantage. Columbus Rival and the Toronto 6ixers stood out for their skill against zones in the wind. Each team could force teams to shift out of their zones quickly or suffer the consequences. The division went mostly to seed with both pools and bracket play with the notable exceptions of Portland Schwa and Seattle Underground beating seed to make prequarters and Atlanta Ozone making semifinals. Pool play was also largely drama-free. Of 24 total pool play games, only two ended on double game point, while 25% of bracket play games have ended on double game point. Comments on "How We Got Here: Club Championships 2017 (Women’s Division)"